People. My computer is possessed tonight. There is a demon living inside of it. It posted a post that I was not finished working on when I did not want it to be posted. THEN. When I had finished the post and was ready to be done with the computer for the day I hit the magic "Publish Post" point. At which point the post was erased. Naturally, I want to get off of this thing as soon as possible. But I do feel like I need to tell you one thing. Today Hubs and I saw The Amazing Spiderman. Boy, they weren't kidding around with that title- the movie really was amazing! The most amazing of it all was the hunk of burning love that they found to play Spiderman- Andrew Garfield, Oh, La, La, La! On the way home from the movie I was thinking about that cute little smile of Spiderman's and at the same time feeling rather guilty for my obvious disloyalty to Hubs. It was at that point that Hubs interrupted my thoughts with, "I'm sorry, Bon, but I gotta say it. I think I have a man crush on Andrew Garfield." Well Hubs, join the party! And now you see why Hubs and I were meant for each other- I mean, come on! We've got the same celebrity crushes! Now, if only I could get him to hop on the Jef Holm bandwagon! Hi Friends! I am Shelby and I blog over at Musings of a Newlywed where I document my everyday adventures with my sweet husband, Thane. I am so excited to be sponsoring Bonnie this month! I love reading her blog and enjoy the spunky sense of humor that she shares with us! I blog because I love the opportunity it gives us to write down the special moments that we have in our lives. Life, obviously, is a huge experience, but everyone has the things that really stick out. Some of those moments may be filled with grandeur like a wedding day or a vacation. Some of those moments may be moments of accomplishment- finishing a marathon or mastering a new skill. And some of those moments are just plain simple, but oh so memorable. Like perfecting a recipe, dancing in the living room, or reading a story to a child. Blogging is a wonderful opportunity to share these amazing things. I truly believe all of life is beautiful- the hard moments, the good moments, and all the stuff in the middle. It’s all good and valuable in it’s own way. And so whether you blog about your cooking moments, your relationship moments, your traveling moments, or even your grieving moments… The point is, you are sharing a gift with the world. You are sharing something precious that has the capacity to influence others. And I just think that is really cool! So, I thought I’d share a moment with you from my own life. Because laughing is my favorite recreational activity, I decided this moment had to be a funny one! For your reading entertainment, here is the tale of my most embarrassing moment. 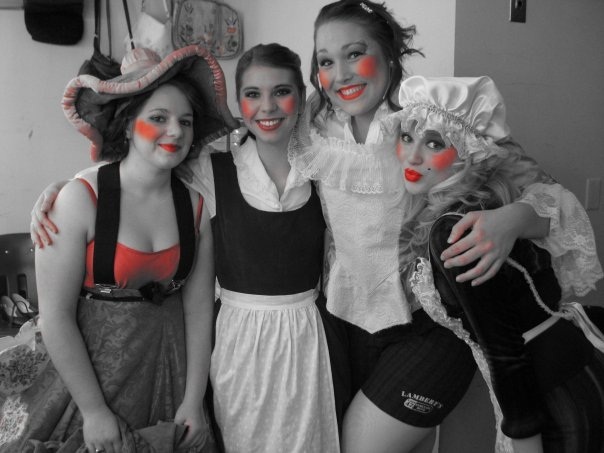 As a senior in high school I was cast as Belle in the musical rendition of Beauty and the Beast. My mom made *the gown*. Ya know, the big, infamous, gold one? Well, my mom is kind of the world’s best procrastinator and sewed my dress the night before dress rehearsal. Well, when I put it on and was ready to get on stage guess what? It was too big! I went out on stage just as the music for “Tale as Old as Time” began. It was my big, shining moment! As the beast and I began to dance my dress began to slip. Just as the beast twirled me out that dress just kept on slipping right down to my waste. And the whole world (or so it felt) and an auditorium of cameras saw it. And my bra. And now forevermore whenever my former 80 cast members decide to show their posterity the video of when they were in Beauty and the Beast, their descendants will also be blessed with visions of me in my lingerie. The end. 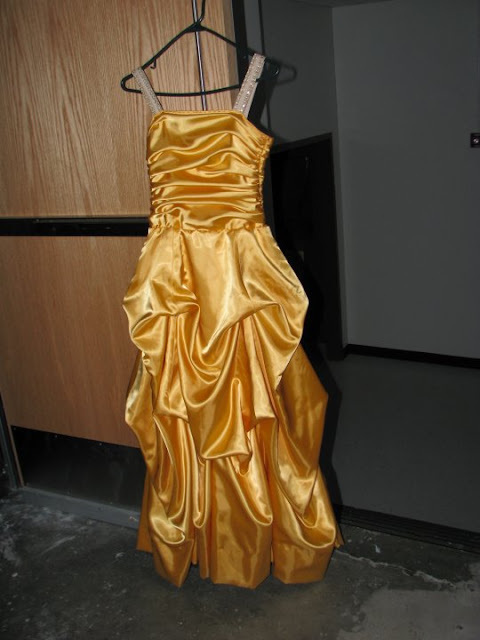 You’ll notice in the image of the dress, the final alterations included straps to help keep it up! So, fellow bloggers, I hope you’ll continue to write your moments down to share! You’ll never know who will find them entertaining, inspiring, or endearing. I told you she was spicy, didn't I?!? Now go hop on over to her blog and say hi! Meanwhile, Hubs and I will be fantasizing about Spiderman. Hahahahahaha I do adore her. And I haven't heard this story yet. Is there a link to her blog in the post or am I just a blind moron? Ha! Stopping by to say "HI" and to follow ya from The ALOHA Friday HOP!!! Thanks so much for sharing your aloha with us, it is so sweet to have you in the mix. I was wondering if that would be a good movie. Seems like the Toby/Kristen one wasn't out THAT long ago. I'm so exited to see that movie!! I'm so glad it's good! Stopping by from the blog hop! Am now a new follower:) Would love if you could follow me back!